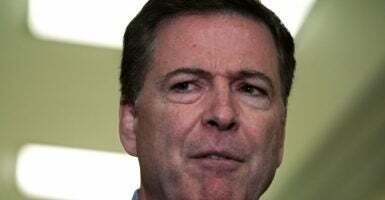 James Comey, former director of the FBI, claimed in an op-ed Thursday that he doesn’t care one way or the other whether special counsel Robert Mueller finds evidence that President Donald Trump conspired with Russia to influence the 2016 election or obstructed the FBI’s collusion probe. But the claim, which Comey made in The New York Times, is at odds with his testimony about his actions shortly after being fired by Trump in May 2017. “I asked a friend of mine to share the content of a memo with the reporter. I didn’t do it myself for a variety of reasons, but I asked him to because I thought that might prompt the appointment of a special counsel,” Comey testified June 8, 2017. Comey’s ploy worked, as Mueller was appointed special counsel May 17, 2017. Though Comey clearly pushed for the special counsel’s probe, he now says he has no preference as to what Mueller will write in a report of the 22-month-long investigation. Comey, who oversaw the FBI’s collusion investigation for more than nine months until his firing, said that he has “no idea” whether Mueller will conclude that Trump knowingly colluded with Russia. He said he does not know whether Trump obstructed justice.